Aspects of nature are so beautiful they take your breath away. But what does beauty mean in a consumer-driven busily-growing city that spreads its development footprint across the city's natural beauty. Natural capital is defined as the resources humans need to live, the quality of the land, of the water, of the health-giving natural resources that are seen to support capital, or the economic viability of society. So natural capital by this viewpoint has nothing to do with beauty, with honouring the beauty of the river valley, with sustaining the intimate relationship and delicate balance between human and nature. Natural capital assumes anthropocentrism rather than the exquisite and intricate subtleties of natural systems or an eco- or biocentric worldview. But a nature-centred viewpoint does not necessarily assume nature is beautiful although it enacts and promotes reciprocal relationship, mindfulness and care. What makes something beautiful? Are aspects of nature beautiful in their own right or do they become beautiful when humans declare them so? Beauty is in the eye of the beholder - in the symbolic capital of a community where objects of beauty, art, sculpture, buildings are deemed valuable by that community or society. Symbolic capital is associated with notions of power, with what is deemed important in society, and as such, projects an ideological and hegemonic perspective which washes over the notion of 'beauty is as beauty does'. In this phrase beauty is both object (it is beautiful) and process (it can affect us deeply by its beauty). I like to think that in the process of beauty making, we are affected so much that we desire to care for nature, for the river, for other than human, and work for their protection. Raising awareness, replanting the river bank, fighting against development, helps sustain community and relationship between peoples, and between people and beautiful places. Imagine changing the notion of symbolic capital to reflect the natural beauty of the environment, the Brisbane River valley and the wealth (but dwindling numbers) of creatures who dwelll here. Imagine a symbolic capital that was not associated with consumption and human use but recognised the symbolic beauty of the river in its own right. 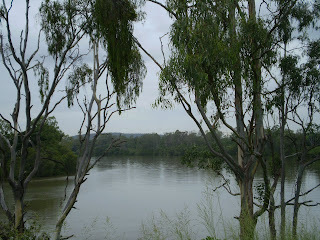 Imagine the heart-lifting moments of relationship with the Brisbane River when the river is not regarded as something to be commodified for its view, transport or provision of water resources but as a place of wonder and intrinsic beauty.